Ranger 160 deliver a new class of deep-cycle battery technology — there are simply no comparable batteries on the market today. 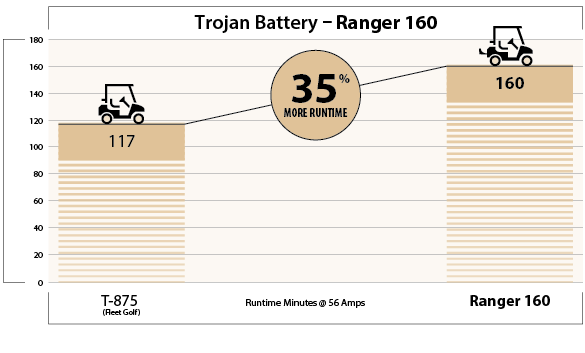 Trojan’s patent-pending Ranger 160 delivers 35 percent more travel time between recharges than today’s current 8-volt golf battery. Based on more than four years of research and development, Ranger 160 illustrate Trojan’s legacy of excellence and innovation — the cornerstone of our success in the deep-cycle battery industry. These batteries are defititely game changers in the industry. The introduction of Ranger 160 is great news for the indsutry.